Social media marketing is one of the fastest growing online marketing strategies today. Social media creates a fusion between marketing, PR, advertising, and true customer interaction. For a brand to begin working with a social media marketing agency, they must first understand their business goals. Then, they will be able to design a website optimization strategy that will support their goals and objectives. Like other Internet marketing efforts and website advertising, social media is an investment in your long term online visibility. Imagine Technologies provides cutting edge social media marketing packages, where we manage campaigns fully, or do consulting with your team. These packages are designed to improve your brand’s exposure on the social web. 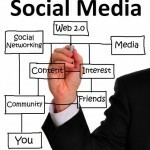 What is Social Media All About ? Discover where their target audience is on the social web. To do this, there is a certain amount of research involved. Imagine Technologies begins the process by consulting with the client to learn more about the business and industry. We then use various research tactics to design to perfect strategy for the brand. Listen to what people are saying about the industry or topics related to the brand. This is an ongoing part of any well-managed social media effort. Listening also comes in handy when you build a solid social media foundation and your customers start not only paying attention, but interacting with you. That’s when you have achieved initial success. Engage your audience in conversation and get involved in the communication. This can also be part of an effective online reputation management program. When your audience realizes that you are willing to communicate with them directly, the process will build trust. You can start by having a blog and feeding these articles to profiles on Facebook, Linked In, and Twitter. You should also consider providing video content to your blog and social platforms. We can help! Provide value to the audience to build relevance and become a trusted source of information. That value can come in the form of blogs, videos, articles, resources, tips, or any kind of interesting content. The more you give them, the more engaged your followers will be. Imagine Technologies can help the client develop this content but encourages a high level of involvement because this is the opportunity to show your customers that you are an expert in your field. Contact us today for a FREE consultation on how to improve your visibility and interaction on the social web.Our pricing structure for social media is based upon the estimated hours involved in planning and management. Campaigns range in cost due to project size and scope. Our social media consulting packages start at $500 per month. Full management packages start at $2,000 per month. We also plan, build and deliver full social media marketing plans that the client can then implement in-house. These plans start at $5,000.